Do you currently have a tip jar on display? If not, it's a super easy way to instantly increase your income. A simple tip jar on your counter can easily add up to at least an extra $10 per day and probably much more. $10/day times 5 days/week quickly adds up to $50 more per week or $200+ more per month! 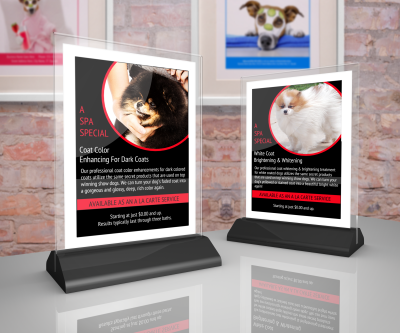 Pictured left: These printable pet grooming tip jar signs are included in both editions of The Groomer's Profit Kit. Editable template versions are also included in the Advanced edition. 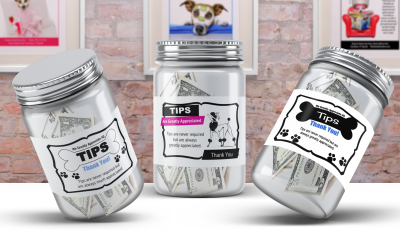 Simply print, tape onto an empty jar and display on your counter for an instant pay increase! 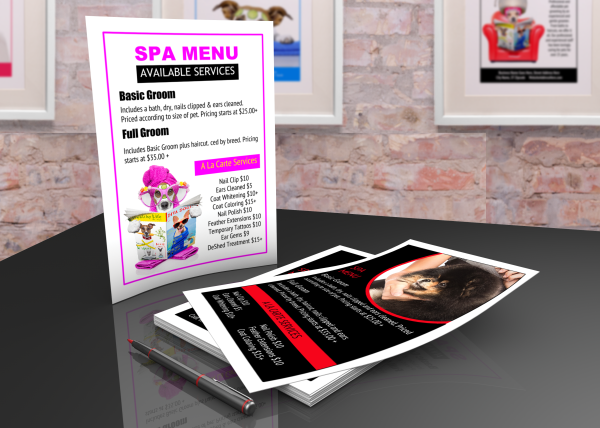 Easily sell additional upgrade grooming services by simply displaying a service menu. Choose from over a dozen different menu designs. Edit and print in minutes. Easy edit templates are included in the Advanced edition of The Groomer's Profit Kit. Edit right online in minutes with the simple drag & drop online editor (with the free Google Slides editor ). Print out in minutes. Create A Price List In Minutes! Easily inform customers of all the services that you offer. Little add-on's quickly add up to additional sales and profits! Templates are included with the Advanced edition of the Groomer's Profit Kit. The average pet owner assumes that all grooming salons are the same. Leading them to pay way too much attention to price. 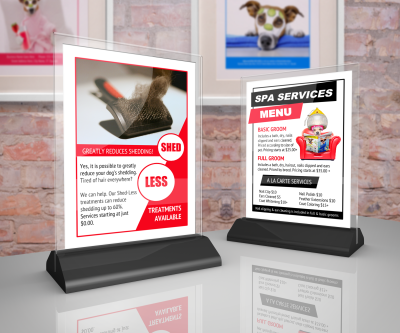 But by placing a few strategic signs around your salon, you can effortlessly begin to improve your client's perceived value in your services AND increase your profits. Pictured left: The Groomer's Profit Kit contains dozens of printable signs. The coat whitening and coat color enhancing signs(pictured) are two of our newest and most popular ones. Services like these are what pet owners slowly begin to pick up on when price shopping. They know their pet looks better when they bring him to you, but they just can't figure out why. Signs like these will show them why. Plus, they add up to additional profits for you. Simple services like coat whitening & color enhancing only take a few more minutes to do and since the products cost just pennies per application, your profits really add up. (Chris Christensen offers a coat color shampoo kit for just under $20 and it's enough to do dozens of dogs. You can find it on Amazon.com or from Cherrybrook) . The printable signs are included in our kit. 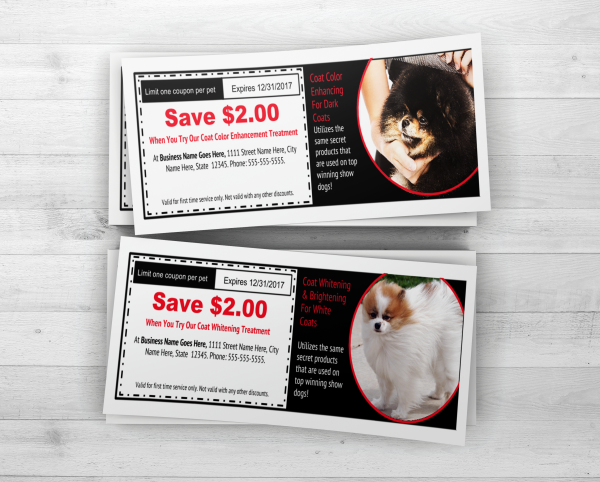 Easily entice grooming customers to add on additional services by handing them a different coupon after each groom. Simple, quick little upgrades such as shed less treatments, nail filing, or nail polish quickly add up to $100's in additional profit each month! Easy edit templates are included in the Advanced edition of the kit. Pdf printable coupons are included in the Basic kit. 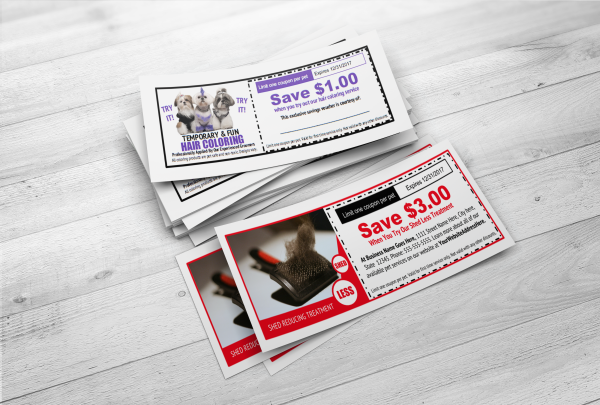 Create and print coupons in minutes for nail filing, nail polish, shed less treatments, coat whitening, coat coloring, feather extensions and more! Each little add-on quickly adds up to $100's more in profit each month! We were excited to find out just how easy & inexpensive this was to implement. 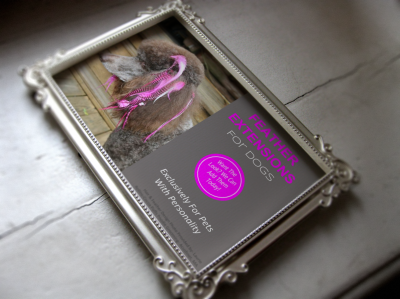 Especially since we already had some printable feather extension promotional posters included in all editions of our Groomer's Profit Kit. Which means that you can begin to offer this great add-on service in your grooming shop almost effortlessly. 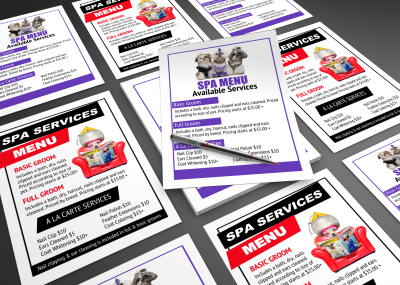 Once you have the tools & feathers, you can begin to effortlessly promote this new service in your salon by printing out the posters and coupons to promote it. 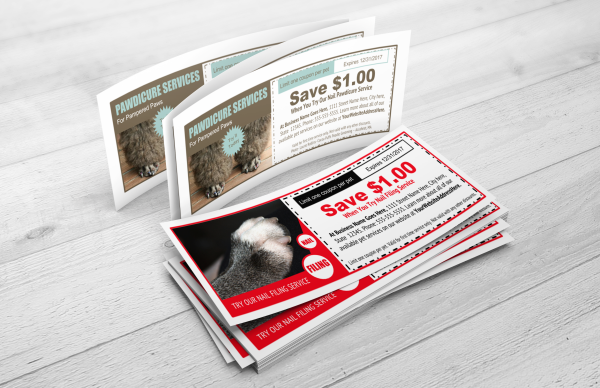 Editable templates for the promo materials are also included in the Advanced edition of The Groomer's Profit Kit and can be instantly downloaded and printed out right from your home computer in minutes. What an easy way to quickly increase your income! 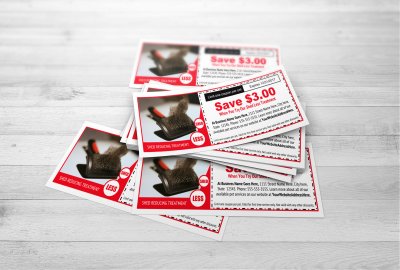 Customer handouts help to educate customers on the importance of brushing and flea prevention. Once educated, customers are then more inclined to purchase brushes and flea products from you. Make additional profits by selling just a few select, retail items ( wholesale pet supply distributors list is included in all editions of The Groomer's Profit Kit) Pictured right: These printable customer handouts will help you to sell brushes and flea products. 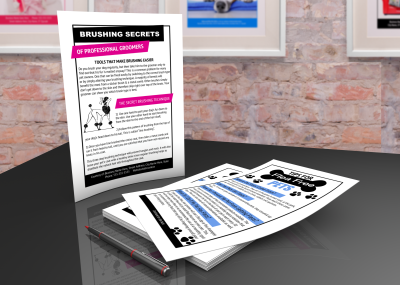 The printable handouts on brushing and flea prevention are included in both editions of our kit. Displaying the handouts and retail items near the counter helps to capture impulse buys. The kit also includes printable price signs that will increase retail sales even more. 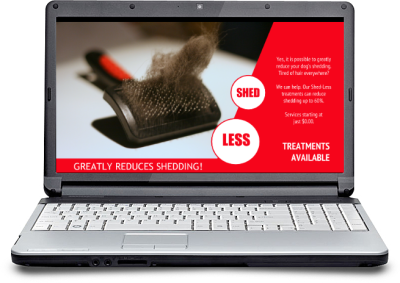 De-shed or shed-less programs sell very well. Your salon may already offer this, but if not, you can easily do it by using either a Furminator or carding the coat with a handheld blade. Sell more of this service by promoting it with a 5x7 counter top sign and also by handing out enticing coupons to your customers to entice them to try it next time. 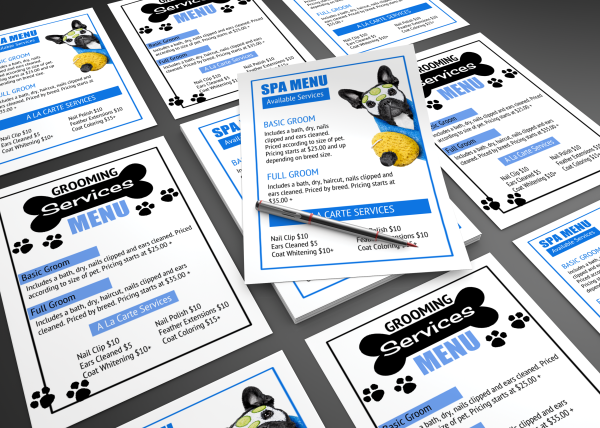 We have included quick printables for both in our Groomer's Profit Kit. Editable templates are also included in our Advanced Edition. It will also help to list your shed-less service on your grooming services menu and to post it occasionally on your business Facebook page. Editable templates for both, are included in our advanced kit. ​This simple report card helps you to increase profits and improve customer loyalty!